Novacem Uses Autodesk Design Software to Produce Zero-Carbon Cement, more carbon dioxide (CO2) is absorbed during the process than is emitted. The cement is based on magnesium oxide (MgO) and hydrated magnesium carbonates. FARNBOROUGH, UK, March 16, 2011 — Autodesk, Inc. (NASDAQ: ADSK), a leader in 3D design, engineering and entertainment software, announced that Novacem, the carbon-negative cement company based in London, is using its AutoCAD Plant 3D software to optimize its plant design and production process, enabling it to develop a new magnesium silicate-based cement that will offer carbon-negative production. Novacem developed a new generation of carbon-negative cement that will offer cost and performance parity with the most common type of cement, Portland cement. The cement is based on magnesium oxide produced from magnesium silicates and is a scalable, transformational alternative to current carbon-intensive cement production. Current technology creates an average of 800 kilograms of carbon dioxide per metric ton of cement. Novacem can go beyond eliminating all of these emissions and can achieve up to 50 kilograms net absorption of carbon dioxide per metric ton of cement. To help increase production and improve efficiency in its pilot plant, Novacem is using AutoCAD Plant 3D software to digitally design and visualize the performance of the plant’s planned automated control systems under simulated real-world conditions, all before the systems are physically built and installed. AutoCAD Plant 3D brings modern 3D design to plant designers and engineers to help streamline the placement of piping, equipment and support structures, reduce complexity and enable them to evaluate designs quickly and easily. Autodesk Vault Professional, Autodesk Revit Architecture, Autodesk Alias Design, Autodesk Algor Simulation and Autodesk Inventor Publisher software. For additional information, visit www.autodesk.com/cleantech. Novacem, the carbon negative cement company, is a spin-out from Imperial College London and has developed a new generation of carbon negative cement that will offer cost and performance parity with Portland cement. The cement is based on magnesium oxide produced from magnesium silicates, and is a scalable, transformational alternative to current carbon intensive cement production. In 2010 the company announced its Green Cement Bond with Lafarge, the world leader in building materials, as the first subscriber. Novacem is a World Economic Forum Technology Pioneer for 2011. Novacem is currently working on a development programme to design construct and operate an Industrial Pilot Plant (up to 25,000 tonnes per year) to be co-located with an existing cement plant. It will work closely with Green Cement Bond subscribers and other industrial partners in this project and the first Commercial Volume Plants which will follow. Thereafter the technology will be rolled out to companies in and around the cement industry to ensure its full potential to reduce carbon emissions is realised. The company raised a £1.1m Seed Round in 2009 from Imperial Innovations, the Royal Society Enterprise Fund and the London Technology Fund. It raised a further £1.6m in 2010 when Laing O’Rourke joined its investor group. It has also received financial and other support from the Technology Strategy Board, the Carbon Trust and industrial collaborators. Many of the Autodesk 2012 products require the installation of Microsoft .NET 4.0. In many cases .NET 4.0 will automatically be installed by the Autodesk 2012 installer however there are system-specific conditions where .NET cannot be installed by the Autodesk installer and will need to be installed manually. Clicking the Update button will automatically terminate your Autodesk product installer and begin the .NET 4.0 installation. To ensure that the Autodesk product installation is not interrupted by .NET 4.0 installation requirements, we strongly recommend manually installing Microsoft .NET 4.0 before beginning installation of your Autodesk 2012 product. Note: This is especially important for systems that will be receiving an Autodesk 2012 product via silent installation of a deployment. Deployments will not check for .NET 4.0 and will not install if .NET 4.0 is not present on the system. After .NET 4.0 has been installed, you must reboot your computer. You should perform this step even if you are not prompted to reboot. After your system has restarted, you can begin the installation of your Autodesk 2012 product. With AutoCAD 2012 there are some changes affecting the command line and text window. Vertical and horizontal scroll bars only appear when hovering on the right side or bottom right. I first though this was a bug, not sure it is such a good feature. This may not add much to the reason why AutoCAD 2012 is better than previous releases but I think having another color on the history is a good thing. I got a support question by a JTB FlexReport customer yesterday and wanted to share the solution. With 6 available licenses and the four users in the reserved group using a license each it should be possible for 2 other users to check out a license. But still when the fifth user try there is no licenses available. JTB FlexReport’s HTML report was reporting 64300ACD_F: 6 licenses 4 in use. Looking at the FlexNet status this information can be found. This shows that all licenses are in use. Notice that two of the user login names does not match when it comes to case. If GROUPCASEINSENSITIVE is set to ON, user names and host names specified with the options file GROUP and HOST_GROUP keywords, respectively, are treated as case insensitive. By default GROUPCASEINSENSITIVE is OFF; user names and host names are treated as case sensitive. Open question here is if there is a need to in either JTB FlexReport HTML, list or chart reports see licenses that are reserved but not in use? Please let me know your thought by email or commenting on this post. You would like to know how to control network license access using an options file with the FLEXnet network license manager. Note: This information applies to all network versions of Autodesk products. Access to licenses is controlled with a FLEXnet® options file that is configured with the settings you want to use. The options file is an optional component of the FLEXnet license management system and is not required for normal license operation. Create a new text file named ADSKFLEX.OPT. It is strongly recommended that you only use a plain text editor, such as Notepad, for editing options files. Place this file in the same directory as your Autodesk license file. Perform a ReRead License File operation from the Start/Stop/ReRead tab in LMTOOLS. Examine the debug log file to confirm that your options file changes have been implemented by the license manager. Note: The examples in this document are intended to serve as samples only. Many options file commands, such as INCLUDE/EXCLUDE, are mutually exclusive. When you use these types of commands you should make sure that the syntax is correct. All syntax following a number sign (#) will be ignored by the license manager. An example of an options file comment is shown below. You can define groups using the Windows login name or the computer name. By default, computer names and user names are case sensitive unless the GROUPCASEINSENSITIVE ON statement has been added to the options file. You can enable/disable case sensitivity for user names and computer names when using the GROUP or HOST_GROUP commands. Specific computers can be defined as part of a project by configuring an environment variable on those client machines. This project designation can then be used to control license access in the options file. The project environment variable is an optional component and is not required when you define groups directly in the options file. Your project is now defined and you do not have to reboot the computer for these settings to take effect. You can reserve a specific count of licenses for a user, computer, group of users or computers, IP address, IP address range or by LM_PROJECT variable association (computer names and user names are case sensitive). You can limit usage of specific licenses for a user, computer, group of users or computers, IP address, IP address range or by LM_PROJECT variable association (computer names and user names are case sensitive). You can block access to specific licenses for a user, computer, group of users or computers, IP address, IP address range or by LM_PROJECT variable association (computer names and user names are case sensitive). Any users, hosts or IP addresses not explicitly excluded will continue to have access to these licenses. You can provide access to specific licenses for a user, computer, group of users or computers, IP address, IP address range or by LM_PROJECT variable association (computer names and user names are case sensitive). Any users, hosts or IP addresses not explicitly included will not have access to the specified licenses. If you want to block license usage for only a few users you should consider using the EXCLUDE syntax. You can configure the license manager to automatically reclaim inactive licenses after a specified time. Inactivity is defined as an idle product with no commands issued in the specified time. Users will be given the option to save their current drawing if a license is revoked by the license manager for inactivity. Time is specified in seconds and the lowest acceptable value for these options is 900 seconds (15 minutes). You can configure the creation of a report log (RL) file for use with the SAMreport™ or SAMreport™-lite usage reporting tools. For more information about configuring SAMReport-Lite, you should refer to the related documentation. The plus sign (+) preceding the report log file path indicates that the license manager should append to the report log instead of overwriting it. Also, the path for the report log should not contain spaces and must already exist (the license manager will not create this location for you). The license manager will create the report log file. Several options file commands control license borrowing for specified licenses. You can specify the maximum duration of time that a specific license can be borrowed for in hours. This value cannot be above the maximum borrow period specified by Autodesk in the product license file. These tips from Autodesk’s Knowledge Base TS15127843 might be useful if you have this problem. You experience that the cursor in AutoCAD®, AutoCAD® Map 3D® or AutoCAD® Civil 3D® is slow or jerky. There may be many causes to this issue. Here are a few suggestions that may resolve the issue. If you have an active virus scan application, such as Bitdefender, running on your workstation, diabling or removing the virus scan application may help. If the issue occurs and appears to get worse through out the day, restarting you computer may help. Disabling Selection Cycling by typing SELECTIONCYLING at the command line and setting the value to 0 may help. If you are experiencing the issue on an HP, Dell or other band of laptop that has a biometric scanner, disabling the Digital Persona (or other fingerprint authentication software) service may help. If you are running Windows Vista or Windows 7, try turning off Aero themes and/or diabling the BitLocker feature. There may be many other machine variables and configuration that may affect this type of issue. While this may not be a complete list of all of the services/features that may cause this issue, it includes many of them that have previously solved the issue for customers reporting it. Have you ever wondered how to edit Sheet Properties and Sheet Custom Properties on many sheets at the same time? 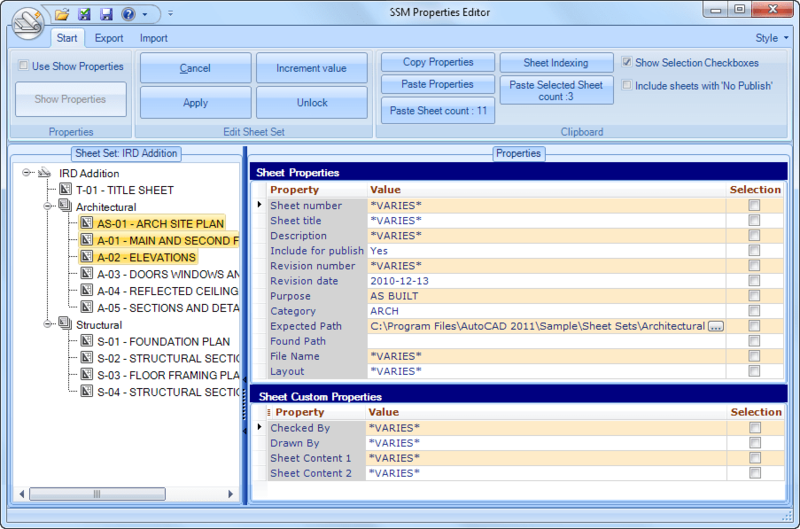 It cannot be done in AutoCAD’s Sheet Set Manager (SSM) but JTB World’s SSMPropEditor can do it. Sheets with .DWG in captial letters are incorrectly showing with an extra .dwg suffix. Existing customers are entitled to this upgrade at no extra fee. Just install the new version. More about SSMPropEditor including downloads. Free trial available. SSMPropEditor is compatible with the latest AutoCAD 2012 with its verticals as well as AutoCAD LT 2012. Congrats to AutoCAD LT 2012 users that now also have access to Sheet Set Manager. In the previous post I mentioned that AutoCAD 2012 and Revit 2012 are Citrix Ready. You wish to know the system requirements for Autodesk products that can be used on Citrix XenApp. Citrix system with XenApp® 6.0, Citrix® License Manager, and Citrix® Profile Manager. Microsoft® Active Directory with support for roaming profiles. Dedicated Autodesk license server for session-specific licenses. Microsoft Internet Explorer 7 (or later). Client computers should be bound to the network domain. Each client computer should install either the full or web online client plug-in. Microsoft Windows Server 2008 R2 and Windows Server 2003. Citrix system with XenApp® 6.0 for Microsoft Windows Server 2008 R2. Citrix system with XenApp® 5.0 for Microsoft Windows Server 2003. You wish to know the requirements for licensing with Autodesk Citrix Ready versions of AutoCAD and Autodesk Revit. Note: Using Autodesk Citrix Ready products requires the purchase of a special license. Contact your Autodesk Authorized Reseller to inquire about purchasing this license. The license is a session specific license. More detail for this will be discussed below. There is no special installer for the Citrix versions of Autodesk products. Therefore they use the same feature name in the licensing system. Licenses cannot be allowed to cascade. You can identify a license file as session specific by reviewing the key words in the INCREMENT. Regular network license files contain the DUP_GROUP key word. Session specific licenses do not. As an example this INCREMENT for AutoCAD Map 3D 2011 does not contain a DUP_GROUP key word. It is therefore a license for only the Citrix environment. Each license is checked out for each session. C699 4DD4 F866 9A99 665E"
As an example this INCREMENT for AutoCAD 2012 does have the DUP_GROUP key word. One license is checked out for the host. This license will prevent license usage for multiple users on the same host and is NOT to be used for the Citrix environment. CB24 903E 7777 6897 71A8 3A41 A220 FA8A 57D6 4AB7 FDFD"
For installation and configuration steps refer to the Single server network license manager quick start guide solution. You wish to know what user interface components most impact the user experience in the Citrix XenApp environment. You wish to know recommended configurations to improve performance. ToolTips and rollover ToolTips significantly impact performance when running AutoCAD on Citrix XenApp. We recommend that you disable ToolTips and rollover ToolTips. To disable ToolTips and rollover ToolTips, click Application menu button > Options. On the Display tab of the Options dialog box, clear the checkmarks for Show ToolTips and Show rollover ToolTips. You can also reset the TOOLTIPS and ROLLOVERTIPS sysvars to 0 at the command line. Dynamic Input significantly impacts performance when running AutoCAD on Citrix XenApp. We recommend that you disable Dynamic Input. To disable Dynamic Input, right-click the Dynamic Input icon on the Map Status Bar or enter DSETTINGS at the command prompt. On the Dynamic Input tab of the Drafting Settings dialog box, clear the checkmarks for Enable Pointer Input, Enable Dimension Input where possible, and Show command prompting and command input near the crosshairs. You can also hide the Dynamic Input icon by right clicking on it and clearing the check next to Display > Dynamic Input. Selection Preview significantly impacts performance when running AutoCAD on Citrix XenApp. We recommend that you disable Selection Preview when no command is active. To disable Selection Preview when no command is active, click Application menu button > Options. On the Selection tab of the Options dialog box, clear the checkmark for When no command is active. You can also reset the SELECTIONPREVIEW sysvar to 2 at the command line. JTB FlexReport can be used to monitor license usage of Autodesk Citrix Ready products. Good news for Citrix users with AutoCAD and Revit based products. Something many been waiting a long time and might be a sole reason to upgrade to the 2012 version. SAN RAFAEL, Calif.--(BUSINESS WIRE)--Autodesk, Inc. (NASDAQ: ADSK), a leader in 3D design, engineering and entertainment software, announced that eight design software products including AutoCAD 2012, AutoCAD Architecture 2012, AutoCAD Map 3D Enterprise, AutoCAD Mechanical 2012, AutoCAD MEP 2012, Autodesk Revit Architecture 2012, Autodesk Revit Structure 2012 and Autodesk Revit MEP 2012 software have been verified as Citrix Ready*. Autodesk, Inc., is a leader in 3D design, engineering and entertainment software. Customers across the manufacturing, architecture, building, construction, and media and entertainment industries -- including the last 16 Academy Award winners for Best Visual Effects -- use Autodesk software to design, visualize and simulate their ideas. Since its introduction of AutoCAD software in 1982, Autodesk continues to develop the broadest portfolio of state-of-the-art software for global markets. For additional information about, visit www.autodesk.com. The Citrix Ready program identifies verified solutions that are trusted to enhance virtualization, networking and cloud computing solutions from Citrix, including Citrix XenDesktop, XenApp, XenServer, NetScaler and GoToMeeting. The Citrix Ready designation is awarded to third-party products that have successfully met verification criteria set by Citrix, and gives customers an added confidence in the compatibility of the joint solution offering. The Citrix Ready program leverages industry-leading alliances across the Citrix partner eco-system to meet a wide variety customer needs, and currently incorporates over 2,800 partners who have demonstrated more than 18,000 product verifications. It also includes the Citrix Ready Community Verified program which allows customers to see thousands of products that have been verified by other customers to work in their production environments. The Citrix Ready program received the Alliance Excellence Award from the Association of Strategic Alliance Professionals (ASAP) for creating a strong community through implementation of new, innovative best practices. More information about the can be found at www.citrix.com/citrixready. Reach Citrix Ready using social media via the Citrix Ready blog site and Twitter. *The Citrix application is network-based, and performance of Autodesk Citrix Ready Applications may vary with network performance. The software does not include the Citrix application, nor does Autodesk provide direct support for issues with the Citrix application. Users should contact Citrix directly with questions related to procurement and operation of the Citrix application. Content Explorer aggregates design content from different folders that have been specified for monitoring by the Content Service (that is using Lucene for index/searching). Content Service is a separate installer. The executable for the Content Service is named Connect.Service.ContentService.exe but Autodesk missed to add file properties to it like a proper description and company name. Now it just has an anonymous description: “Service”. With Content Explorer you can index design content for quick access, catalog the objects in each file, and search for content in local folders (not external drives and USB devices), network folders (not Windows network drives), and the Autodesk Seek Library. Users performing searches in Content Explorer may encounter incorrect paging results. Indexing problematic DWG files would require the Content Service to be restarted. Searching on a network drive that is configured to use a substitute path may not return any results. Please review the readme document for installation instructions.